OK, let’s talk romantic gifts during this week of love: Do you and your hubby exchange gifts for Valentine’s Day? We usually just give things like love notes, flowers or a homemade meal. Well, I’ve gifted a homemade meal, anyway. Luke’s time in the kitchen usually yields some sort of (very practical, albeit decidedly un-romantic) ground beef casserole. According to this article by The Dating Divas on what guys really want for Valentine’s Day, a home-cooked meal was one of the top 3 most popular requests! I’ll bet you can guess at least one of the other 2, hehe. On the years we’ve stayed home for V-Day, we often opt for takeout (I love me a good steak!) and a decadent homemade dessert. 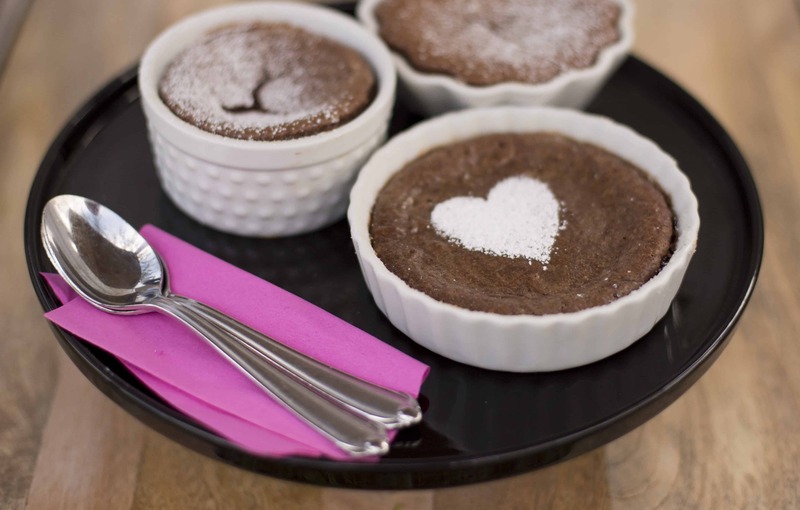 These mildly spicy chocolate lava cakes are THE perfect V-Day treat, especially with a dollop of cream. Spices, hot lava and whipped cream… talk about romance! They are amazing and so rich that just one serving in a small ramekin is enough to satisfy any sweet tooth. Melt 1 cup butter and spices in a saucepan over low heat; remove from heat and add chocolate. Let sit for one minute and then stir with a rubber spatula. If necessary, return to low heat briefly until all chocolate is melted and smooth (be careful not to overheat!). Whisk together eggs, egg yolks and both extracts in a bowl. Add flour and powdered sugar and mix until smooth. Add slightly cooled, melted chocolate mixture and whisk until combined. Pour evenly into greased ramekins. Place filled ramekins on baking sheet and bake at 400 degrees for 12-14 minutes. Remove when tops and edges of cakes look set and dry. Let cool for several minutes before turning out onto dessert plates, or you can serve right out of the ramekins. Dust with powdered sugar or add some whipped cream or ice cream. Now go make some heat in the kitchen!